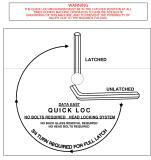 "Wrench Hex Tool backbox latch 5/16"" has been added to your cart. Backbox latch hex key wrench tool for Data East / Sega / Stern / JJP machines. Made from special high torsion strength steel.